The investigation involves Banks and two companies he is associated with — Better for the Country (BFTC) and campaign group Leave.EU. BRITISH POLICE HAVE opened a criminal investigation into a top Brexit donor over his alleged use of offshore companies to finance the campaign to leave the European Union. The probe came after the Electoral Commission said it had “reasonable grounds” to believe Arron Banks — an insurance company owner who was the single biggest donor behind the campaign to leave the EU — was not the true source of the loans made to the pro-Brexit camp. The National Crime Agency (NCA) said its “investigation relates to suspected electoral law offences… as well as any associated offences” by Banks and two companies he is associated with — Better for the Country (BFTC) and campaign group Leave.EU. Banks said today that he was happy to have the opportunity to clear his name. “I am confident that a full and frank investigation will finally put an end to the ludicrous allegations levelled against me and my colleagues,” Banks said in a statement issued by Leave.EU. “I am a UK taxpayer and I have never received any foreign donations,” he said. “Gone fishing!” one of the tweets said. The Electoral Commission said its investigation into alleged campaign violations focused on £2 million (€2.3 million) reported to have been loaned to BFTC by Banks and his insurance companies. The Electoral Commission said it had “reasonable grounds to suspect that Mr Banks was not the true source of the £8m loans made to Better for the Country”. It further believes that the loans involved companies incorporated in the British overseas territory of Gibraltar and the Isle of Man — a crown dependency — which is not permissible under British electoral law. 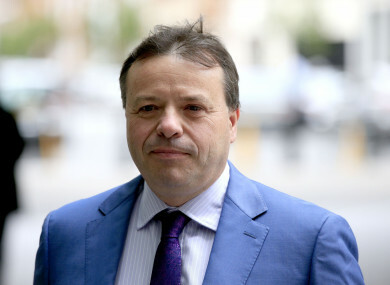 “Arron Banks, Elizabeth Bilney and others involved in Better for the Country, Leave.EU and associated companies concealed the true details of these financial transactions,” the Electoral Commission said. The commission’s legal counsel Bob Posner said at least £2.9 million of the money funnelled into Leave.EU “was used to fund referendum spending and donations during the regulated period of the EU referendum”. “The financial transactions we have investigated include companies incorporated in Gibraltar and the Isle of Man,” Posner said. Banks said in his statement that the Electoral Commission was acting “under intense political pressure from anti-Brexit supporters”. Email “Criminal investigation opened into top Brexit donor's alleged use of offshore companies”. Feedback on “Criminal investigation opened into top Brexit donor's alleged use of offshore companies”.